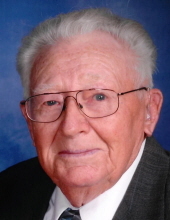 Virgil A. Fedler, 97, of West Point, Iowa passed away at 6:20 p.m. Sunday, January 27, 2019 at the West Point Care Center. Born on April 29, 1921, the son of Lawrence and Mayme (Rotter) Fedler. After the war, he came back home and married Marjorie Wiggenjost on April 19, 1947. She preceded him in death on November 24, 2017. Survivors include three sons: Gary (Becky) Fedler of West Point, Iowa, David Fedler of Nevada, Iowa, and Gordon (Susan) Fedler of West Point, Iowa; one daughter: Caryl (Ron) Abolt of West Point, Iowa; ten grandchildren: Michelle (Matt) Williams, Stefani (Shane) Pitkin, Megan (Justin) Sorensen, Brian Fedler, Scott (Janel Barnes) Fedler, Kimberly (Jason) Kempker, Kevin (Emma Hartz) Fedler, Sara Fedler, Kelly (Nathan) Lange, and Jill (Joey) Jordan; ten great-grandchildren: Nick, Lilly, & Carrie Williams, William & Timothy Sorensen, Connor Kempker, Elsie, Noah, & Isaiah Lange, and JJ Jordan. He was preceded in death by his wife: Marjorie; his parents; one brother: Lester Fedler; two sisters: Irene Slater and Loretta Scharpman; one daughter-in-law: Chris Fedler; one great-granddaughter: Ellie Williams; four brothers-in-law: Bill & Bert Wiggenjost, Keith Slater, and Bill Scharpman; and one sister-in-law: Eileen Wiggenjost. Virgil attended St. Mary’s grade school. He served in World War II from 1942 to 1945 in Ireland, France, Belgium, and Germany. He was awarded the Quilt of Valor for his services in the army. He was a farmer all of his life. Virgil was a member of the St. Mary’s of the Assumption Catholic Church where he sang in the funeral choir. He was a member of the Holtz-Geers American Legion of West Point and was a member to the Circle 8 Square Dance Club for over 53 years. He loved farming and working on the farm, going hunting, mushroom hunting, fishing, square dancing, playing cards, putting puzzles together and visiting with his friends and their farm neighbors. Although, he was retired from farming for quite a few years, he never truly gave it up. He made many woodworking projects for his whole family. Most of all, Virgil enjoyed his children, grandchildren, and great-grandchildren very much. Friends may call after 12:00 p.m. Thursday, January 31, 2019 at Schmitz Funeral Home in West Point where the family will meet with friends from 3:00 p.m. to 6:30 p.m. A Parish Rosary will be recited at 3:30 p.m. and a Christian Wake Service at 6:30 p.m at the Schmitz Funeral Home in West Point. The Mass of Christian Burial will be held at 10:30 a.m. Friday, February 1, 2019 at St. Mary’s of the Assumption Catholic Church in West Point, Iowa with Father Bruce DeRammelaere as celebrant. Burial will be at Calvary Cemetery in West Point with Full Military Rites presented by the Holtz-Geers American Legion Post #668. A memorial has been established to the Holtz-Geers American Legion Post #668. To plant a tree in memory of Virgil A. Fedler, please visit our Tribute Store. "Email Address" would like to share the life celebration of Virgil A. Fedler. Click on the "link" to go to share a favorite memory or leave a condolence message for the family.